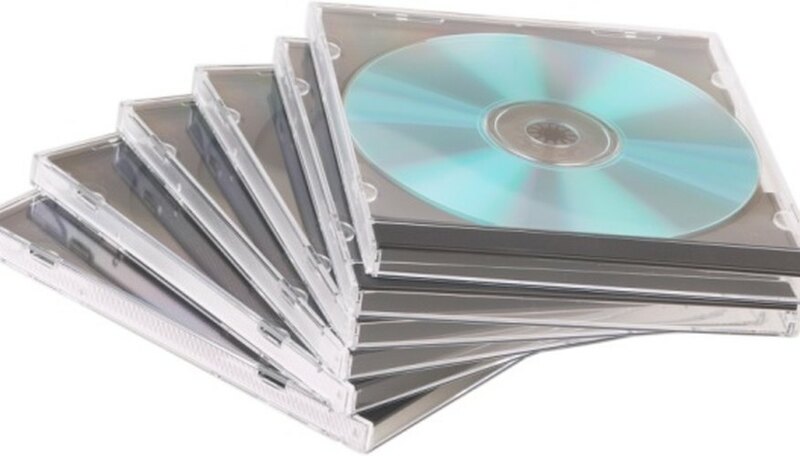 You may have a number of reasons for wanting to create your own CD case cover, also called a jewel case or j-card. Whether you are creating custom covers for your own backup collection, or professionally designing a cover for an album release, the CD case cover must fit the case properly. You can provide the foundation for your design by using a template that can be used by your printer, buying blank j-cards to print at home, or pre-cutting them yourself. Draw a rectangle measuring 9.53 inches by 4.72 inches on a heavy piece of paper. Measure over to 4.76 inches and draw a line down the center. Cut out this rectangle and fold in half along the center line. Slip it into the cover of the jewel case and trim if necessary. This is the front and back of your insert booklet. Draw a second rectangle measuring 5.46 inches by 4.72 inches on another piece of heavy paper. Cut out this rectangle and lay it centered in the back of your jewel case. Crease along both of the sides to create the spines. Draw your desired art on the cover and the back j-card. You may choose to write the song names on the back or inside of the booklet. You can use any art medium or style you desire, as long as it does not create too much bulk that could cause the j-card to no longer fit the case. Obtain a CD case template to use in your graphic editing program. Several free templates are available online for programs such as Microsoft Office, Adobe InDesign, Adobe Illustrator or Corel Draw. Templates that come in a PNG format are also compatible with a wide range of print and image editing software. If you are printing your j-cards professionally, check with your printer because it may have templates you can download along with detailed instructions. Open the template in your chosen design program. Set the resolution to 300 dpi and the color to CMYK. In Adobe programs, these settings are found under the "Image Mode" and "Image Size" menu options. If you are using Word or Adobe Acrobat, these settings will be handled for you by the template. Ensure the template clearly indicates the bleed, margin, trim-line and folds. The printer you use determines what the minimum bleed and margin are, but typically they are 3 mm wide. If the indicators are not there, you will need to add guides or margins manually or keep the type and main body of your artwork about 10 mm from the outside edges. Compose your image using layers and vector text where possible. This technique keeps the fonts crisp and helps avoid fuzziness around the edges of your art or text. Use fonts that will be large enough to read at the printed size or use print previews to gauge scale. Flatten your image prior to saving it. Save the file in the same format the template was in, or use a format that is compatible with your printer such as EPS, PDF or AI. Open your graphic design program and create a new file that is 1,925 pixels by 1,913 pixels at 300 dpi (or 6.417 inches by 6.377 inches.) Create a rectangle in the center that is 4.75 inches by 4.72 inches. Set guides or margins 3 mm from each edge to establish your bleed. If desired, create another set of guides or margins 3 mm inside the rectangle to establish a safety margin. Design your cover on a new layer. Use fonts that will be large enough to read at the printed size or use print previews to gauge scale. Keep the main body of your art and type within the safety margin, or at least 3 mm from the inside edges of the rectangle. Save the file as two layers (guides and art) unless your printer requests a flattened file. If printing the file yourself, load the file into your printing program if different from your graphic editing program, and assure the margins are set properly prior to running a draft. If you will be cutting out the cards yourself, this is not critical. Check with your printer or graphic software vendor for CD j-card templates. The majority of brands offer free downloads that will make the job much easier. Do not attempt to print images that are less than 300 dpi, or resize a smaller image to the dimensions of the j-card. This will leave the cover looking pixelated and poor quality. If using Word, insert text boxes to control the layout of text. Text boxes can be dragged around over the top of your art or background and resized easily. Always include bleed margins. Printed pieces are cut to size in stacks and do not get cut exactly on the trim lines. Bleed refers to the cover art extending beyond the trim line, which prevents any blank paper from showing along the cut edges. Assume dark colors will appear a shade darker when printed, and take care when designing dark compositions. Two similar shades of grey, for example, may not print as distinguishable as they appear on the monitor. Vail Joy is a longtime writer, designer and copy editor with a vibrant background in corporate business writing, technical writing and music journalism. Since 1996 she has been published in various music magazines, poetry compilations and business publications. Joy's writing specializes in design, technical and art-related topics.